Most of the commentary that I’ve read about the “first 100 days” has been centered around President Obama. But what we have really just experienced is the first 100 days of absolute Democratic Party rule. This has been the first Congressional session since January 2005 when Democrats held safe majorities in both houses of Congress, and also held the White House. They are the sole architects of all our domestic and foreign policies. Our nation will be steered in the direction dictated by their agenda for at least the next four years. 1) The Democrats have delivered virtually no new legislation. The Stimulus Bill was little more than a collection of 14 years worth of pet pork projects that stood little or no chance of passage in a Republican-controlled Congress. The Omnibus Spending Bill was, again, little more than a collection of pork and earmarks left over from the 2008 Congressional session. S-CHIP was virtually the same bill that President Bush vetoed last year, and the Lilly Ledbetter Fair Pay Act was originally introduced in 2007. 2) President Obama and the Democratic Party simply lied to us when they promised accountability and transparency in the legislative process. President Obama’s campaign promises about “no more secrecy”, “five days to look online,” and “line by line” were all broken thirty days or less after he took office. And “pay as you go“? 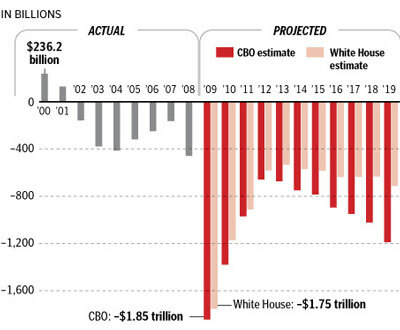 Now that we’ve committed spending nearly $10 trillion for health care reform, stimulus, the 2009 omnibus bill, TARP and related bailouts and toxic asset buyouts, and the FY 2009 Federal budget, Obama has finally decided that maybe Congress should start thinking about where all the money is going to come from. Nice. And what about “coming together,” “reaching across the aisles,” “post-partisanship,” and “governing from the center”? Instead of bipartisanship we got a double-whammy of “I won” and “Don’t think we’re not keeping score.” I feel more united already. Don’t you? 4) The desire of Democrats to take control of private industry is also staggering. First the banking industry (and yes, part of the blame rests on President Bush for failing to place necessary limits on the Treasury Department vis a vis TARP), then the automotive industry, and next will be the health care industry. By the time it’s all done, over 1/5 of our (formerly) private sector will be controlled by the government. And where does the Constitution give the Federal government the power to do any of this? Where does the Constitution give the President the power to oversee bankruptcies, or hire and fire business executives? For that matter, where does the Constitution give the President the power to oversee the Census? Liberals complained that Bush “shredded” the Constitution. Today’s Democrats don’t seem to know that it even exists. Come to think of it, no new legislation from this bunch is probably a good thing. 5) It’s been truly painful to watch Leftist/Progressive ideology at work in our State Department. I think they called this “smart diplomacy.” The Democrats are completely sold on the post-modern intellectualism based on the idea that wealthy, light-skinned people always seek to dominate and exploit others, and therefore are universally and solely responsible for the suffering of darker-skinned, poor people. So naturally America and Israel share responsibility for all the things wrong with the world today, especially with regard to the strife of Islamic peoples. The Democrats are also convinced that payoffs and appeasement are sure-fire solutions to all the problems either created, or allowed to continue unchecked (so the Democrats claim) by the previous Administration. I should also add that in spite of the predictions of those who lauded Obama as the smartest, most capable man ever to set foot in the Oval Office, the embarrassing series of gaffes emanating from the White House has been troubling, but also highly amusing. Yet the more these things happen, the more they undercut the credibility of this Administration. Tax, spend, appease. That about sums up most of what has transpired for the last three months. As a conservative, nothing makes me more uncomfortable than those three policies. But right now that’s what we as a nation have chosen, so we must live with them. Although I hope and pray for peace, recovery, and stability, history seems to tell us that expensive, oppressive domestic policy, combined with submissive foreign policy, is not the best way to achieve those goals.